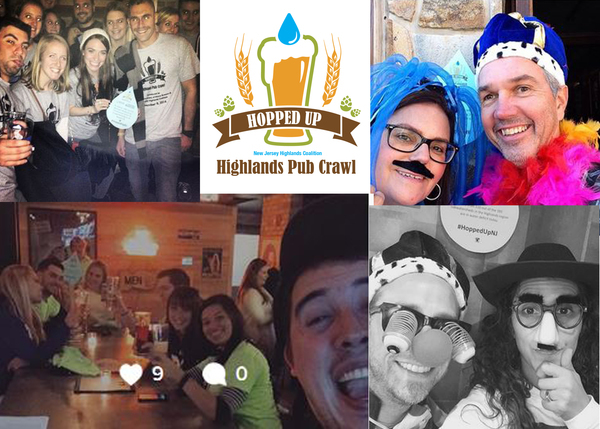 Check Out Our 3rd Annual Hopped Up Pub Crawl! Everybody loves to party in addition to helping charity. If you have a passion for flavorful and interesting beer, come join us on October 22, 2016 starting at 6:00PM where the New Jersey Highlands Coalition will kick off a SaveH2ONJ event, the 3rd Annual Hopped Up Highlands Pub Crawl in Morristown. Delicious, clean water is the essential ingredient in what makes all the great craft beer we enjoy in New Jersey. Our water supply for 70% of the residents of New Jersey begins in the New Jersey Highlands. This year’s route includes the following craft beer bars: Sona 13 (13 South Street Morristown, NJ), Tashmoo Restaurant & Bar (8 Dehart St, Morristown, NJ), George and Martha's American Grille (67 Morris St, Morristown, NJ) and will end at End of Elm (140 Morris St, Morristown, NJ). Each venue experiences waves of patrons that will arrive at a predetermined time that day. Follow us on social media as we reveal the names and styles of the beers at the specific locations. A group of volunteers will ensure another smooth, successful event for the 100 plus pub crawlers.